The EQ3-2 mount receives high marks from experienced observers. 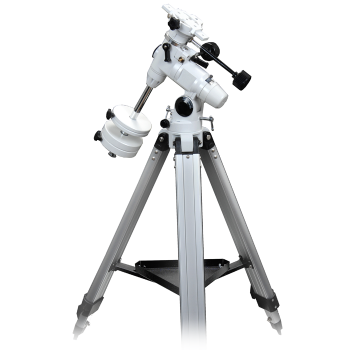 This sturdy mount offers precision and stability along with a host of other features for the serious astronomer. Slow-motion control knobs allow for continuous manual tracking of celestial objects. The precision mount features full 360º worm-gear tracking controls on both R.A. and DEC. axes. Dual metal setting circle dials allow quick location of target using celestial coordinates. An optional polarscope is available for aiding in polar alignment. Optional single-axis and dual-axis D.C. motor drives can be installed for auto-tracking purposes. With the appropriate upgrades and accessories the mount is fully suitable for astro imaging, including long exposures. Precise adjustment of the polar axis in azimuth and altitude for precise polar alignment. Availability of a polar alignment scope. Availability of a dual axis motor drive. During long exposures a correction of drift in the DEC axis will usually be necessary. Since you cannot touch the mount during exposure you will need a motor for this!